Welcome to my online community for authors! If this is your first visit to my website, you’ve found a place where fiction and non-fiction authors at any experience level can get expert book marketing advice. As a book marketing consultant for more than 10 years, I’ve coached over 600 authors, worked with numerous publishers, and helped clients hit the New York Times bestseller list three different ways, including fiction, non-fiction, and even backlist non-fiction. I know what works, and I’m happy to share my expertise. Sign up below and download these 3 e-books for FREE designed to help you jumpstart your book sales. In addition, you’ll receive my weekly e-newsletter, The Monday Marketing Minute, packed with expert book marketing advice you can immediately apply. Besides all of the free advice and tips you’ll find on this website, I also offer paid options to work directly with me on your book campaign or author career. Please note that I do not accept clients who “just want to hit the bestseller list.” My expertise involves helping hard-working authors build platforms and careers that consistently grow over time. 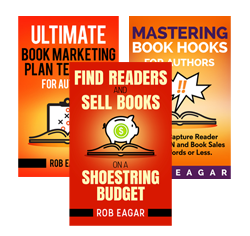 Click here for details about my popular courses, “Selling Books on a Shoestring Budget” and “Mastering Amazon for Authors.” Get my expert instruction while learning how to market your books at your own pace. Click here for details to request a personal consultation to get my input and advice on your most pressing book marketing questions. Click here for details about the ultimate option to learn advanced book marketing tactics, discover new revenue growth techniques with everything customized to your specific books and author career. Click here for details about my proven process to help publishers identify marketing blind spots and uncover new opportunities to maximize new book launches and revive backlist.